Struggling with thousands of tickets? Want to improve your HelpDesk experience? What if you could automatically suggest some articles related to customer’s queries even before they submit their ticket? Sounds great right? WSDesk Auto suggestion option can do this for you. 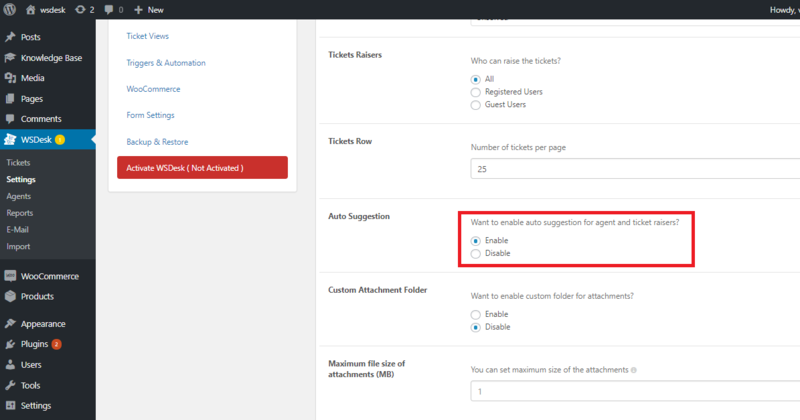 This article gives you an understanding of how WSDesk Autosuggestion can reduce ticket inflow and empower your customers with self-service. What is WSDesk Auto Suggestion? Whenever a customer types the subject line for their query all the articles that have tags to that particular word are shown below. The customer can go through those articles and find a solution. And if the right solution is available, there is no need for the customers to raise a ticket. This can potentially reduce the ticket inflow considerably. Above screenshot shows how autosuggestion appears whenever a customer is about to raise a ticket. How to enable Auto Suggestion? Assigning Tags for Auto Suggestion is really easy. Just go to WSDesk -> Settings ->General ->Auto Suggestion and enable it. That’s it! When you type a particular word in the subject field, WSDesk searches the title and content of all your posts and if it finds a match for your search, it will show the suggestions. Let’s take a look at how the WSDesk Auto suggestion feature impacts businesses. • Less number of tickets for support agents. Since many customers can solve their issues on their own, the ticket number will be lesser and the customers will be more confident. Let us look at how Mark uses Auto suggestion feature to handle his helpdesk in a better way. Mark owns a company and he uses WSDesk as his helpdesk, he used to get many tickets asking how to set up IMAP? He was tired of replying to those tickets with same answers every time. Then he found the WSDesk Autosuggestion feature. It made his work lot more easily than before. He created an article on “How to configure IMAP” and tagged it to some keywords such as IMAP, configure etc… So whenever a customer types IMAP or any other related keyword, they will get suggestions for that article which he made. Thus the ticket number related to IMAP decreased significantly. He created articles for all his frequently asked queries and tagged it to related keywords. Even if someone created a ticket he replies to the ticket easily by using this autosuggestion feature. • Customers can get a better solution in lesser time. Since the agents also get AutoSuggestions they can provide their customers with a better solution. You don’t need to bother about a lot of reply questions bouncing back after your reply. Let us see how one eCommerce customer Franklin make use of this Autosuggestion feature. Franklin was having a lot of issues related to a product which he bought from one of the companies. Whenever he raised a ticket, he used to get replies in small sentences which didn’t give him a clear picture of the solution. He was so frustrated at times and had to reply asking some doubts wherever he was not clear. However, after some time this company installed WSDesk, and the support agents started using the autosuggestion feature. Now, whenever Franklin types the subject for his issue, he gets auto suggestions of articles with solutions to those issues. Now he gets an entire article to read and understand how to solve his issues instead of one or two sentences that he used to receive earlier. Franklin is now very happy with his support system and is confident in solving many of the issues by himself. This feature reduced the efforts of both Franklin and the support agents he was interacting with. • Integration with the knowledge base. Since the support team deals with lots of problems daily, they will always have a better solution to their knowledge base. Integrating the knowledge base with AutoSuggestion using certain tags can make your helpdesk experience much better. Using the Auto-suggestion feature can make a huge difference in the burden you are facing right now and can have a hassle-free helpdesk system. For more interesting features of WSDesk, please visit the official product page here.